High Tech Italian Design proudly manufactured in USA. 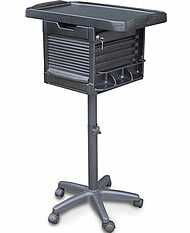 All around utility lockable cart for hair stylist, barbers, pet groomers, vets and more. Height adjustable stand. Large ABS hard plastic working top with easy to clean surface. Two side pockets with tip-preventing dividers and wire support for additional product storage. Four easy rolling twin-hooded casters. - Top Working Tray: ABS Hard Plastic 16" x 24"